Rydell & Lembke Kyl- & Värmeteknik AB designs, builds and installs systems for industrial and commercial environments. We manufacture our own special units in line with customer specifications, but we also stock a wide range of products from Carrier. We feel it is important to keep the technical development of new products alive. We work together with other technology companies and are involved in the development and testing of new products. Through a service agreement with us, your company will enjoy scheduled repairs and regular servicing of its heating system. 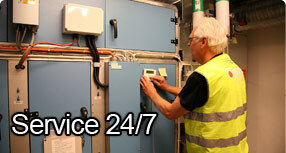 Our service agreements include 24/7 on-call, all year round service. Please contact us if you have any questions regarding the service agreements we can offer you.